As the weather gets warmer and bulbs start poking through the soil, thoughts often turn to yard work. But before you reach for your shovel or grab your leaf blower, you should consider the possible consequences: upper or lower back strain, neck strain and pain in the shoulders. – Wear supportive shoes. Good foot and arch support can prevent some back strain. – Stand as straight as possible, and keep your head up as you rake or mow. – When raking, use a “scissors” stance: right foot forward and left foot back for a few minutes, then reverse, putting your left foot forward and right foot back. – Bend at the knees, not the waist, as you pick up yard equipment or piles of leaves or grass from the grass catcher. Make the piles small to decrease the possibility of back strain. 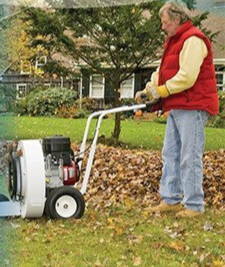 – Regardless of what piece of lawn and leaf management equipment you use, make sure it has a strap and that you use it. Place the strap over your head on the shoulder opposite the side of your body from the device. This will help normalize your center of gravity. – Be sure to switch the side on which you operate the equipment as often as possible, and to balance the muscles being used, alternate your stance and motion frequently. – Try ergonomic tools. They’re engineered to protect you when used properly. – When mowing, use your whole body weight to push the mower, rather than just your arms and back. – If your mower has a pull cord, don’t twist at the waist or yank the cord. Instead, bend at the knees and pull in one smooth motion. – Take frequent breaks from the activity of the day. Muscle fatigue may be felt when using any of these devices for an extended period of time. – If your equipment is loud, wear hearing protection. – Be sure to include a warm-up/cool-down period that involves stretching to help avoid injury. If you have pain from spring yard work, call our office at 425-778-9600. We may be able to help.